Fun is the Buzzword for Holiday Shopping at Lady’s Image! At LADY’S IMAGE, you can park at the front or the back door. Everything in the store is unique and there are many choices. They gift wrap everything, FREE! I chose to leave the store while they wrapped my purchases and took my wife out to dinner at a restaurant nearby. The next day I stopped at the store and picked up my gifts wrapped in gold paper with red bows. Those gifts looked so fabulous, I wanted to show them to everyone I knew. Now, I could have stayed and they would wrap while I waited, but, hey, I had more fun eating while Lady’s Image did all the work of wrapping. In addition, the gift-wrap was FREE. No HASSLE no STRESS. Just Smiles, Laughs and Fun. LADY’S IMAGE has been the BEST OF DELAWARE winner for Casual, Career, Occasion, and Most Unique for 16 years running. You will know why when you see their selection of must-have items along with updated classics. If there is ever a time to visit LADY’S IMAGE, this is it. LADY’S IMAGE has this unique Twist Necklace in either gold tone or silver tone. 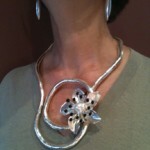 The necklace can be twisted into many clever shapes and is so lightweight you don’t even feel it. As a little extra dazzle, add a clever magnetic pin to the necklace, it makes it look awesome and size isn’t an issue. 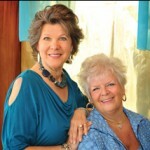 The Twist Necklace is a great gift for women who are arthritic because the Twist Necklace has no closure. It slips over the head and the magnetic pin is easy to attach. In addition, both are easy on the budget: Twist necklace is $39.00 and the Magnetic pins begin at $39.00. Whether it is a foxy party outfit, a smart casual look, an edgy office ensemble, an item or a gift for a special someone, you will LOVE the selection at LADY’S IMAGE in sizes 2 to 22. Come, join us this week and become a HAPPY LADY’S IMAGE SHOPPER. You will discover why Delawareans have voted LADY’S IMAGE “BEST OF DELAWARE” 16 years running. Park at the front or back door for easy access to STRESS-FREE shopping. When others talk about walking a mile to get to a store, when they say everything looks the same in all the stores, when they say shopping is a misery, you will say, “I have a fabulous time shopping at Lady’s Image”. FIND YOU THE SEASONS BEST! place to find a Bridal gown . Next Story → Why The Gift of Jewelry?